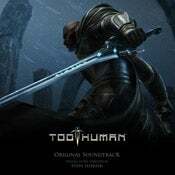 Too Human had a mixed reaction from reviewers. I thought the game had merit, but was flawed. Now you can buy what some may say was the best part of the title: The music. The soundtrack, which was originally scored by Steve Henifin and performed by the FILMharmonic Orchestra and Choir Prague, is selling for $10 to $17 through Amazon.com, Best Buy, iTunes and CD label's Sumthing Distribution's website. I can dig listening to a bit of Too Human when relaxing, maybe as ambient sound. But the write for the soundtrack's release totally lost me. The music ranges by location and scenario. There are moments of long beds of orchestral music, followed by electronic/metal sounding tracks that put the listener into a different space altogether. There are also vast ambient tracks that are made of layers upon layers of sample-based sounds and evolving electronic sounding textures as well. So while the music and audio is Norse in its presentation, it is not exclusively Norse in its sound. It branches out quite a bit, but still stays in the realm of an ancient lost world of technology. It also has its moments using a more aggressive contemporary sound. In places, the Silicon Knights audio team brought in layers of electronic elements, but in a more subtle way. The cyber elements are more elegant and organic in style. In some cases the song style was influenced by the style of the instrument itself, whether that be a Balaban, Bone flute, Frame Drum, Bagpipe or something else, making the phrasing and general feel of a song constructed around the characteristic of that one instrument.